Hello all you loyal readers and those out there in gigabyte land who have been following our 150 Favourite Canadian Things! Recently our friends at Amazon reached out to us about giving the gift of reading this Father's Day, and as a bunch of men, some of who are fathers, and all of whom have fathers, we were excited to join in. Armed with our new Kindle Paperwhite we've been diving back into our favourite works from north of the 49th parallel. Over the next five days we will be highlighting some of our favourite Canadian authors and books as part of our 150 Favourite Canadian Things, while updating you on our experience with the Kindle Paperwhite. Thanks to its high resolution, glare-free screen and the long lasting battery life we have been cruising through some stories near and dear to our maple-glazed hearts. Amazon wants to go even further, and is partnering with us to give away a $150 Amazon.ca gift card, that's enough for a Kindle Paperwhite of your own! On Instagram, share one of your favourite Canadian things tagging @realmantravels and #RMT150. 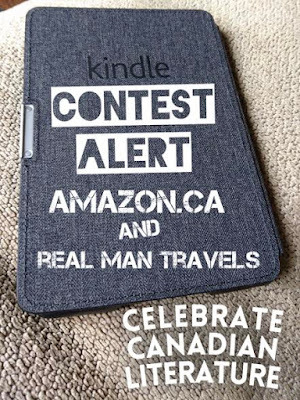 On Twitter, share this story, tag @realmantravels and #RMT150 and share one of you favourite Canadian things. On Facebook, share this story, tag @Real Man Travels and #RMT150 and share one of your favourite Canadian things. Contest Closes at 11:59 pm EST on Sunday June 18th, 2017. The winner will be announced Canada Day (what were the odds of that)! In the meantime, if you are looking for a last minute Father's Day gift, head on over to Amazon and give dad the gift of reading with the Amazon Kindle Paperwhite.